Trap music remains an important part of the music culture because of its distinctive sound. The content of the songs included in this genre is typically the same as other niches of rap, with drugs and money being the prime bragging points and Philadelphia rapper PnB Rock does nothing to make himself dissimilar during his latest project. 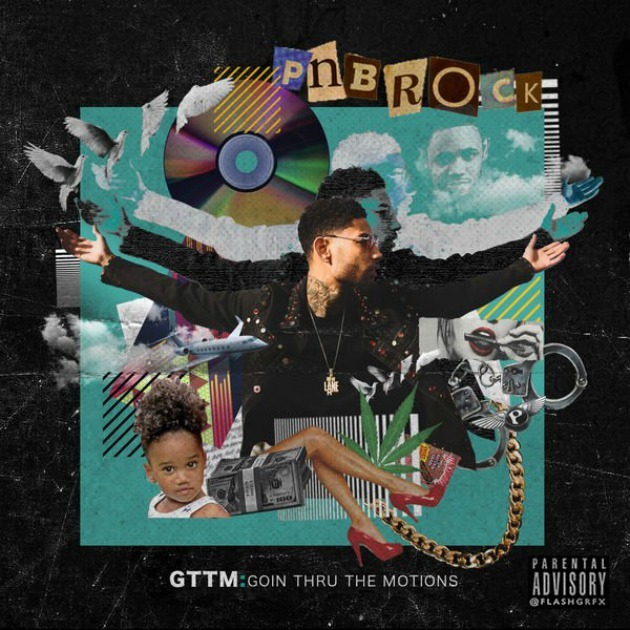 His first studio album, “GTTM: Goin’ Thru the Motions” fails to bring the insightful glimpse into his perspective that should be expected from a new rapper. The songs here aren’t anything special; they rely on the distinguishable sound of music that is trying to be singles, and are just made to be infectious amongst listeners. The meaning of ‘infectious’ is probably not the definition expected. However, in this concept, the songs are mainly ones that will garner a reputation for being played at parties just because of the popularity. “Attention,” the opener of “GTTM” starts the album off on a weak note and feels forced with a mechanical techno beatThere is nothing to learn from PnB in this track; it does not come off as something that would be replayed, but as a bragging song for him to get the chance to brag about his material possessions. Wiz Khalifa is featured on this track but does not save the song, despite his best efforts. The chemistry is odd; it never existed to begin with, and pairing two artists who sound as awkward as ever together usually never works out. The ignorance and excessive simplicity of the lyrics in this project are also a low point. Lines like “Off weed off lean/I don’t ever stay sober” and “Diamonds dancing/you can see my s*** like blu ray” on “New Day” feel like a backwash of everything trap music has ever been, and the three topics they love to include. The other problem with this track is that it does not even sound pleasing and even irritates at times. The point of the track was to generate hype around it as a song that would be catchy and ‘hard’ so it is confusing what route or audience Rock wanted to attract with his method for accomplishing this. There are a few moments when the album shines, nonetheless. “There She Go” serves as a rhythmic track that makes great use of auto-tune to describe a woman Rock is supposedly chasing. “Selfish” actually draws empathy out of Rock’s situation, as he wants a girl all to himself. The vocals work here, make their purpose clear, and give Rock interesting material to work with. project all the way through, they would very quickly notice that a majority of the songs revolve around love and heartbreak, but not in the traditional sense. The times where this actually comes off as genuine end up sounding fresh and unorthodox compared to rappers like Lil Wayne and 2 Chainz. While not a groundbreaking album by any means. “Goin’ Thru the Motions” is sure to please people who could really care less about subject matter. Maybe after all, that was Rock’s purpose from the start.